5/8 Cup of Coffee: Three Red Sox affiliates played doubleheaders on Saturday, making up for lost time in a rainy week on the east coast while Low-A Greenville's game only lasted five innings due to technical issues with the left field lights. William Cuevas (pictured) spun a gem on the mound for Pawtucket, while Keith Couch and Travis Lakins turned in solid performances. Outfielder Aneury Tavarez was the standout hitter on a night where Yoan Moncada homered and Andrew Benintendi ripped an RBI double. The PawSox dominated in the first game of their twin bill against the Red Wings on Saturday. William Cuevas started for Pawtucket and, though he struggled with his control, was nearly unhittable. He tossed 5 1/3 scoreless innings, allowing a hit and five walks while punching out seven. Anthony Varvaro pitched in relief and struck out a pair in 1 2/3 perfect innings. In addition to Pawtucket's strong pitching performance, the bats were also firing on Saturday evening. The PawSox broke through with a four-run first inning, when Marco Hernandez laced a two-run homer to right, scoring Deven Marrero, who had three hits. Just two batters later, Chris Marrero added to Pawtucket's lead with another two-run shot. Jantzen Witte homered in the fifth inning and then the PawSox followed with a barrage of hits to put up three more runs in the inning. Sam Travis went 2 for 3 with two runs and an RBI, raising his average to .305 this season. After a dynamic performance in the first game of their doubleheader, the PawSox were unable to sustain their dominance into the second game. The PawSox got off to a quick start, scoring two in the first on a two-run double by Rusney Castillo, who was 2 for 3 in the game. However, they could not push any more runs across the plate. Chris Marrero followed up a strong performance in game one with a 1-for-3 showing with a double in the nightcap. Pawtucket turned the second game of their doubleheader into a bullpen game, giving left-hander Robby Scott the start. Scott went 3 1/3 innings, allowing a run and walking three. Noe Ramirez was tagged with the loss, allowing two runs in 1 2/3 innings. Wesley Wright closed out the game with a pair of scoreless frames, striking out two and walking two. The Portland bats were stymied on Saturday evening in Reading. The Sea Dogs were only able to muster one run, which came on a sacrifice fly by Wendell Rijo, scoring Ryan Court. The big bat for Portland was Aneury Tavarez, who was 2 for 3 with two doubles. Keith Couch drew the start in the first game of Portland's doubleheader on Saturday. Couch allowed just a run through six strong innings, allowing three hits and two walks. Williams Jerez worked in relief, lasting only 1/3 of an inning before allowing the game-winning run as Reading walked off. The 9-20 Sea Dogs, fresh off a loss in game one of the doubleheader, again dropped a close one in Reading. Portland scored single runs in the first three innings, coming on an RBI groundout by Cole Sturgeon, a sacrifice fly by Jose Vinicio, and an RBI single by Ryan Court. However, they were unable to sustain their offensive attack, only scoring one more run. Aneury Tavarez again went 2 for 3 with a double. Mitch Atkins started on the mound for Portland but lasted just 3 2/3 innings. He allowed four runs on six hits and two walks, striking out three. Left-hander Luis Ysla was dominant in relief, however, fanning two in 2 1/3 perfect innings. Ysla now has a 4.85 ERA and 12/5 K/BB in 13 innings pitched this season. Rob Wort finished out the game for the Sea Dogs, allowing a run in 1 2/3 innings. It was a quiet day for Salem's bats in game one of their doubleheader. Salem netted their first run in the second inning, when Rafael Devers, who was 2 for 3, knocked a one-out double and then promptly scored on another double by Jordan Betts. Betts again capped a rally for Salem in the fourth, driving in Danny Mars with a single. Matt Kent started for Salem and went the distance, throwing six innings and allowing four runs on nine hits, walking none. Salem fell behind early as Winston-Salem produced two-run innings in both the first and second. However, Red Sox starting pitcher Travis Lakins settled down to turn in a solid performance, allowing those four runs on eight hits in six innings, striking out six and walking one. Austin Maddox pitched an inning in relief, striking out the side. However, the big bats for Salem woke up in a huge eight-run fifth inning. Salem sent thirteen men to the plate in the inning, with the first five men reaching base before a three-run homer by Yoan Moncada. This marks Moncada's third home run in six games as the first-ranked prospect is on a power surge, now slashing .330/.460/.530 this season. The Red Sox scored two more runs in the inning, coming when Andrew Benintendi stroked an RBI double and then scored on a sacrifice fly by Mike Meyers. The Drive's Saturday night tilt against Columbia was suspended in the fifth inning due to technical difficulties. Through the first five innings of the game, the Drive fell behind as Columbia scored a run in the fourth and then four more in the fifth. Logan Boyd started for the Drive, throwing 4 2/3 innings and allowing 5 runs (3 earned) on six hits and three walks. Jeffry Fernandez threw 1/3 of an inning in relief, walking one and fanning one. The game will resume Sunday at 2:00 PM. Player of the Night: William Cuevas dominated for the PawSox on Saturday evening. The 25-year-old right-hander threw 5 1/3 shutout innings, holding Rochester to just one hit. Cuevas did struggle with his control, walking five batters, but he also struck out seven in a dominant outing. 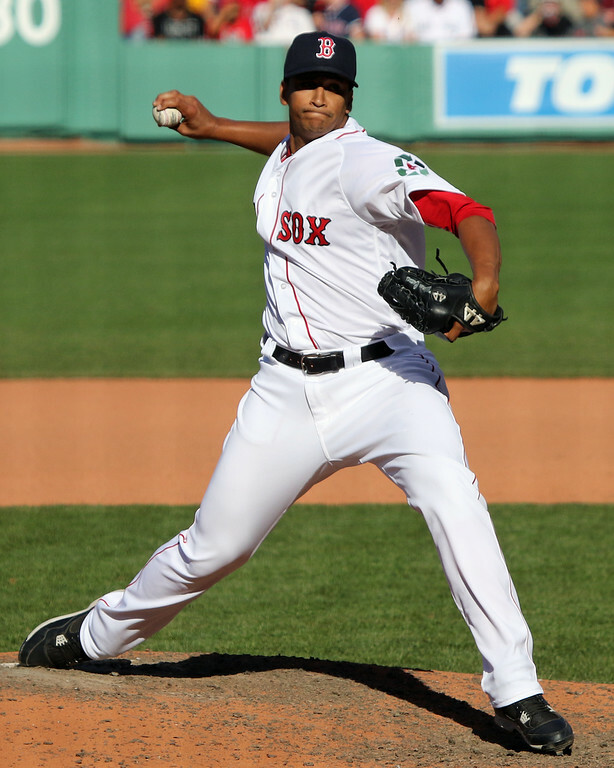 Cuevas has performed well in Pawtucket this season, pitching to a 3.13 ERA with a 24/15 K/BB in 31 2/3 innings pitched.